Fraudulent credit card use is a serious criminal offense. At Printed Playing Cards, we work closely with the credit card institutions to crack down on fraudulent credit card purchases. Through the use of sophisticated real-time cross referencing and address verification, fraudulent purchases are immediately discovered and the credit cards used in the transactions are blocked to prevent further unauthorized usage. In addition to protecting us, this also protects consumers by assuring that their credit cards are not used without authorization at any other business. We at Printed Playing Cards are committed to providing an online experience that allows you to shop with confidence each and every step of the way. To make that possible, we've taken the necessary precautions to ensure your confidential information stays secure. Bottom line: Your information is safe here. 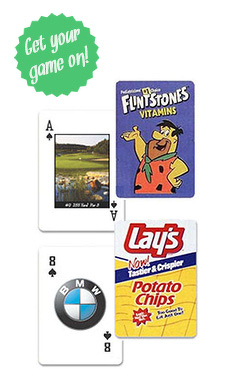 As a courtesy Printed Playing Cards will add you to our preferred customer list and you will receive special offers from our family of sites via email. If at any time that you want to stop receiving these specials you will be able to simply unsubscribe to this service.